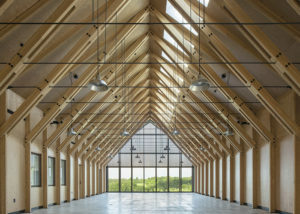 The Tashjian Bee and Pollinator Discovery Center at the Landscape Arboretum in Chaska, Minnesota, is a wood-framed structure that highlights both the functional and cosmetic beauty of wood as a building material. 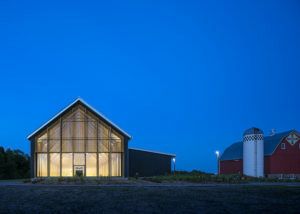 The long, narrow 7,680 square foot structure includes exhibit space, an apiary, classrooms, and a honey house and is situated facing south, so that 80% of the space is daylit. 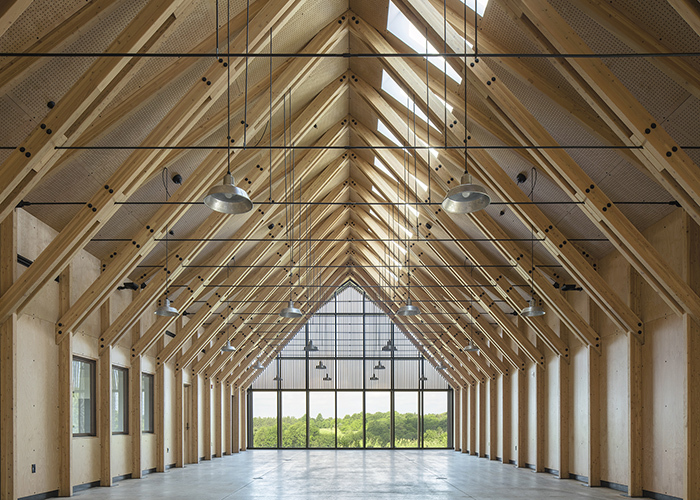 Exposed glulam wood trusses with steel tension rods support the exhibit space roof and structural insulated panels (SIPs) increase the building’s thermal rating. Project challenges included synthesis of the SIPs with adjacent building materials and height limitations, and detailing the structure to accommodate full height window openings. If solar panels were added to this building, a net-zero energy rating would be achieved. The project received both a 2016 American Institute of Architects MN Honor Award and a 2016 WoodWorks Wood Products Council Wood Design Award.